My most cherished scent memories as a child were in the library experiencing real books which created a world of wonder and exploration. Living now in a technological world filled with iPads, Commodity Book takes you into the New York Public Library to recapture the experience of yesterday; turning the pages and breathing in the smell of dry paper mingling in with the open fresh air. That's a quote from Ketrin Leka, the perfumer who developed the fragrance Book for niche brand Commodity. How could I resist, right? I love reading more than almost anything else, and I do as much of my reading as possible from actual books, and the Main Reading Room at the New York Public Library's 42nd Street branch is one of my favorite places in the world. Given my paired bibliophilia and aromaphilia, you'd think I'd fall hard for Book. Did I? Not really, for two reasons. First: it doesn't smell anything like a book. If you're a book-lover, you know that books — especially old books — have a unique smell. Earlier this year, Bois de Jasmin alerted me to a Guardian article about a recent scientific study conducted at University College London's Institute for Sustainable Heritage. Researchers had analyzed the aromas of books and created a “historic book odor wheel” to describe the results — including notes of grass, vanilla, musty wood, and much more. So, how does Commodity's Book smell? Its official description lists top notes of cedar, rosewood, eucalyptus and bergamot; heart notes of cypress, amyris and amber; and base notes of musk, sandalwood and velvet. To my nose, Book begins with something unexpected that smells like a freshly sliced cucumber. The bulk of its composition is a blunt cedar-and-sandalwood duo that stings my nose a bit and lasts for a couple of hours on my skin. It's androgynous and a little rough around the edges. The dry down is a sweeter, muskier rosewood-and-sandalwood blend with a very light hint of creamy white florals, less masculine than the woods of the heart notes. Book has very good lasting power, and its sillage is intense for the first hour but then turns more subdued. Within one wearing, a second cause for ambivalence dawned on me. Not only does Book not smell like a book, but it smells uncannily like another perfume that I detect all-too-frequently on my fellow New Yorkers, on the subway between Manhattan and Brooklyn, in upscale clothing boutiques, in cocktail bars. . . yes, you guessed it: Le Labo Santal 33.1 Looking back at Kevin's review of Le Labo Santal 33 (from 2011! ), I catch certain phrases that could also apply to Book: "some entangled cedar and sandalwood with a dash of turpentine...a weird, but not unpleasant, dill-like note...an inexpensive-smelling, candied, slightly floral musk aroma." Basically, not much about Book (or Commodity in general) feels new to me, but I suppose I'm not the target consumer. Once again, I'm just getting cranky when I see ideas being appropriated and recycled for a new audience. Well, I'll be all right. It's nothing that a cup of tea and a good book won't fix. 1. Also see Olivia Fleming, "That Perfume You Smell Everywhere is Santal 33," The New York Times, November 15, 2015. 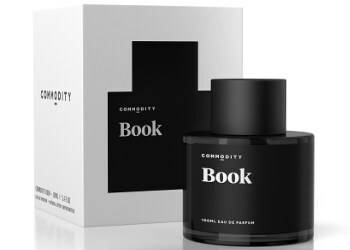 Commodity Book is available as $105 (100 ml) or $26 (10 ml) Eau de Parfum at Sephora and the Commodity website. Note: top image is Books HD [cropped] by Abhi Sharma at flickr; some rights reserved. Thanks for that review Jessica. I have tried a few book scents but none have really given me the tactile pleasure associated with the real thing. Adding a link that I found interesting . I really enjoy all your reviews. Thanks for the link, Kanuka! 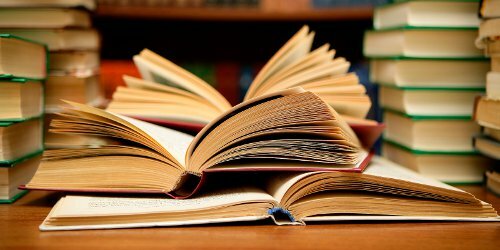 I agree: no other experience can rival that of reading an actual book. I tried the Commodity fitting set and was pretty unimpressed. Seems like a brand for people who are more interested in their minimalist aesthetic than their actual smells. Its aesthetic must be a big part of its appeal. And I suppose it’s good that Sephora has something minimalist-ish to offer…although people would be better off seeking out Le Labo, Malle, or any of a dozen brands available at places like Barneys. I just realized that the notion of the “smell of old books” seems to be appealing to a lot of people. I spent a few years as a grad student among stacks of old books, and while it wasn’t outright unpleasant I never thought it was especially pleasant. It may be the personal library of a wealthy person (which may be scented with potpourri and has other objects that can give off strong odor, such as leather chairs, and many books bound in leather) that people are thinking of when they come to a fragrance with a “old book” note. Oh, for me, it’s definitely the old book smell. Musty, a bit mildewy, even, but also dry and somewhat dusty. And the actual papery smell. Heaven. Of course, I adore proper old-school chypres, which can strike some noses as mildewy. Deteriorating paper gives off a sweet, woody, vanilla-y smell, that I strongly associate with used paperback bookstores, and of which I’m very fond. I think CB I Hate Perfume’s In the Library captures it really well. I worked in a secondhand bookstore for awhile and people would literally walk in the door, close their eyes, and sniff. I love used-bookstore smell, which is very different from the smell of the Morgan Library, for example — but both intrigue me! The perfumer’s reference to the “fresh air” here is really weird, since the windows in the NYPL reading room are never open!! Yes, I did guess it. I was thinking of Santal 33 a sentence or so before you mentioned it, and – ah ha! Yes. I dislike that cucumber-dill effect so I’m not tempted by either fragrance. It’s pleasing that Book is much cheaper. Seeing the uber-chic brand being undercut in that manner makes me smile. There is something about the way paper breaks down as it ages that produces a woody-vanilla-like effect, apparently. I’m sure Luca Turin discusses this in one of his reviews. Can’t remember which. Le Labo’s Patchouli? Something like that. Yes! There’s a molecule in decaying book pages that’s very similar to vanillin, apparently. The people at the Institute for Sustainable Heritage identified it a few years back. It’s funny, I didn’t think of Book as being cheap (at least, not the full bottle), but given the prices of Le Labo, it’s a relative bargain!? I tried the range at Sephora and the very first one I picked up to smell was Book because I have yet to find the perfect book scent. Like you, I was unimpressed. That said, I have 2 Commodity discovery kits still shrinkwrapped. Agree, the perfect book scent is elusive! but thankfully it’s still free for the sniffing at used bookstores everywhere. Enticing review, Jessica, thank you. I’m re-interested in trying the Commodity scents to see if any of them float my boat. Or not. I’ve skipped trying them in the past, but next time I wander into Sephora I will look for Book. I might try a few others from the line, just to see what I think…but it’s taken me a while even to get around to this one, as you can see! The whole concept is just “old hat” for perfume-obsessives who’ve been around for a while. I think I can like the smell of old books without wanting to smell like them myself. Actually, that’s true for a lot of scents I like. Hah, I agree. I even feel that way about tuberose and gardenia…I love them in a vase, but not on my skin. For those interested in an “old book” layering idea, I sprayed vintage Chaps to the middle of the chest and less than a half spritz of the Fantasy the Nice Remix just above the navel, and I got more or less what I would want from this idea. Wow, Chaps!! I remember that one! I am a librarian and I do try to check out (ha ha) biblio-scents. Looks like I can keep this one on the shelf. I have the CBIHP In the Library, which is appropriately quiet. And I have several of the Imaginary Authors line! There are many librarians in my work life and my personal life. Thank you for what you do!! I’m fond of Imaginary Authors too. Wonderful concept, fun packaging, smart and affordable scents! I laughed at your comment “I suppose I’m not the target consumer,” because that’s what I had said to myself as soon as I saw the product photo! I do like CB’s In the Library.